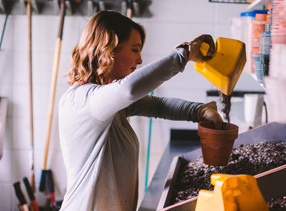 Two important opportunities for DePauw philosophy students to excel and to work together with faculty are the Ethics Bowl competition and the senior thesis. The Ethics Bowl is an event inspired by the nationally televised “College Bowl.” Teams of three to five college students exercise their moral reasoning skills in a friendly and competitive atmosphere by debating the best solutions to complex and difficult moral problems drawn from real life. The students who compete in Ethics Bowls represent a cross-section of majors - an illustration of the breadth and depth of ethical dilemmas in our society. 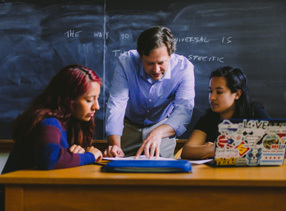 Faculty advisers are professors of philosophy Marcia A. McKelligan and Robert D. Newton, Jr. At the Bowl, there are matches in which each team competes against one other. Each team is scored by a panel of judges for each match on the quality of their arguments and their rebuttals of the other teams. A team of DePauw University students emerged from the Seventeeth Intercollegiate Ethics Bowl Championship as the national champion. The event took place February 28 in San Antonio, Texas, as a part of the Association for Practical and Professional Ethics’ 2013 22nd Annual Meeting. 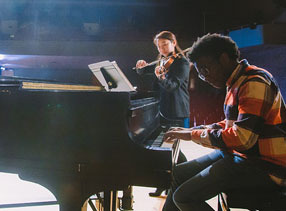 DePauw's winning team consisted of seniors Ben Hoffman, Alex Landreville, and Sara Scully, along with junior Ethan Brauer and December 2012 graduate Mohammad Usman. 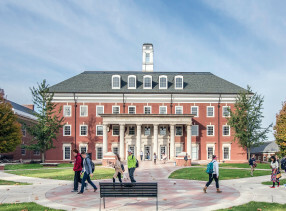 The team is coached by Marcia McKelligan, Blair Anderson and Martha Caroline Rieth Professor of Applied Ethics and professor of philosophy; and Robert Newton, professor emeritus of philosophy. 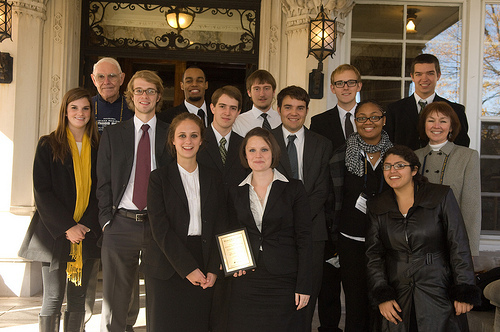 DePauw also emerged as the national champion of the Bioethics Bowl debate tournament in March 2012. 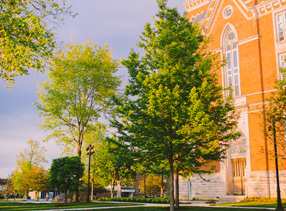 More information is in the DePauw University news release. For the seventh time in eight years, a team from DePauw University reached the semifinals at the national Ethics Bowl competition, which took place in Cincinnati March 1. 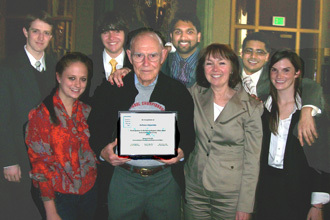 DePauw students Ethan Brauer, Benjamin Hoffman, Kumar Amarnath, Mohammad Usman, Sara Scully (seen l-r in photo with coaches Elizabeth "Nicki" Hewell, Prindle Graduate Fellow; professor emeritus Robert Newton; and Prof. Marcia McKelligan) competed against 30 other teams from across the nation. 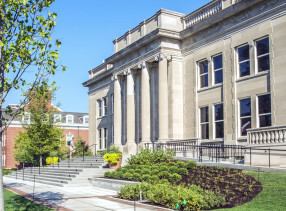 More details are in the DePauw University news release. One of DePauw's Ethics Bowl teams advanced to the national Intercollegiate Ethics Bowl competition after placing second at the 12th Annual Central States Regional Ethics Bowl at Marian University on November 6th. Taylor University finished first at the Saturday event with 153 points, with the DePauw team of Hallie Moberg and Nicki Hewell (co-captains), Stephen Worden, Ethan Brauer, Alex Lopatka and Kyle Gough two points behind. This marks the sixth time in the last seven years that a DePauw squad has qualified for the national event. A second DePauw team finished in a tie for thirteenth place with 128 points. Its members were Robert Steele (co-captain), Brittney Belcher, Andrew Pace, Alex Landreville, Sara Scully and Sehrish Khan Saddozai. Twenty teams participated in the Central States Regional competition, representing schools from Indiana, Ohio, Kentucky, Michigan and West Virginia. Institutions represented included Butler, Xavier, Indiana and Wright State universities, the University of Michigan, and Centre College. 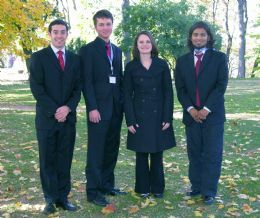 The top four finishers advance to the national Ethics Bowl, which takes place in March 2011. DePauw's Team 1 won the Central States Regional Ethics Bowl, the fourth win for DePauw in the last five years. DePauw sent two teams to the competition. Team 1 included Robert Newton (co-coach, standing at left), Todd Schmid, David Cylkowski, Elizabeth ("Nicki") Hewell, and Marcia McKelligan (co-coach) as well as Lauren Lefebvre and Hallie Moberg (seated). DePauw's Team 2 (Scott Conner, Shashi Kiran, Michael Sears, Robert Steele and Ben Sweeney; which included four first-time Ethics Bowl participants) also did well, winning two of its three matches. By virtue of the victory, Team 1 earns the right to compete in the National Ethics Bowl which will take place in Cincinnati on March 5, 2009. For more information, see the DePauw University News release. Team 1 from DePauw University finished second at the Central States Regional Ethics Bowl, which took place on the campus of Marian College in Indianapolis on November 10, 2007. The ninth annual event featured 14 squads from 9 colleges and universities in Indiana, Tennessee, Ohio and Kentucky. 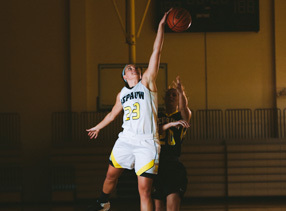 DePauw's Team 1 (pictured at right) was captained by Nick Casalbore and also included David Cylkowski, Kelly Gagnon, Emily McGill and Lauren Lefebvre. The students are all philosophy majors at DePauw. DePauw's Team 2 (below) placed ninth in the Ethics Bowl. It consisted of Todd Schmid (captain), Jeff Shetler, Hallie Moberg and Sahahi Kiran. By virtue of their second place finish, Team 1 went on to compete against 31 teams at the National Intercollegiate Ethics Bowl Championship, which was held February 21st in San Antonio, TX, in conjunction with the Annual Meeting of the Association for Practical and Professional Ethics. They were able to advance to the quarterfinals before being eliminated. Clemson University went on to win the event. For more, see the DePauw University News release. 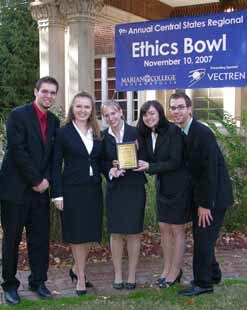 In November 2006, A team representing DePauw University won the Central States Regional Ethics Bowl for a third consecutive year. The event featured 15 squads from colleges and universities in Indiana, Illinois, Ohio and Kentucky. 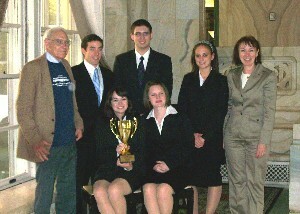 By virtue of the victory, the DePauw team earned the right to compete in the 13th annual National Ethics Bowl in Cincinnati in February 2007. The DePauw team members are, left to right: Nick Casalbore, David Cylkowski, Kelly Gagnon, Jaclyn Harr, captain, Marcia McKelligan, professor and co-coach, Robert D. Newton, professor and co-coach, Lauren Lefebvre, and Emily McGill. For more information, see the DePauw University News release. 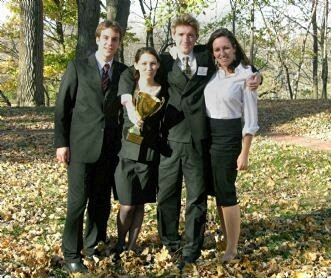 In November 2005, DePauw's "team two" -- Nick Casalbore, Jaclyn Harr, Mike Schmidt, and Shelby Sleight (seen left to right in photo) -- won the seventh annual Indiana Regional Ethics Bowl and earned the right to compete in the 12th annual National Ethics Bowl in Jacksonville, Florida in March 2006. DePauw's "team one" -- Amanda Arnold, Phil Exline, Alex Nelson and Dan Story -- finished tenth in the event, which featured 20 squads from 16 different colleges and universities in five states. For more, see the News release. 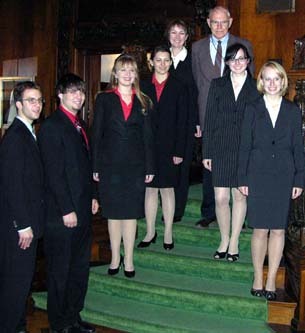 In March 2006 in Jacksonville, DePauw's team in the National Ethics Bowl finished among the top 8 squads in the year's field of 40, reaching the quarterfinals -- a first. The team -- Jaclyn Harr, Mike Schmidt, Shelby Sleight, Nick Casalbore, and Dan Story (seen left to right in photo) -- defeated Concordia, tied Texas State, and prevailed over Western Michigan before losing in the quarterfinal round to Union College. For more, see the News release. 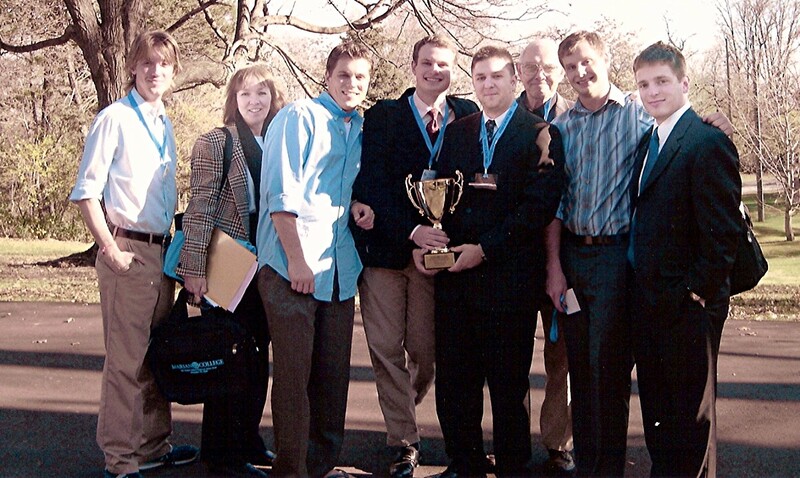 In November 2004, DePauw's "team one" -- Patrick Murphy, Daniel Kelley, and Daniel Story -- won the the sixth annual Indiana Regional Ethics Bowl and earned the right to compete in the 11th annual National Ethics Bowl. DePauw sent two teams to the competition, in which twelve colleges and universities were represented. A team of five DePauw students won three of four matches and finished fourth overall in the First Annual Indiana Regional Ethics Bowl held in Indianapolis. Members of the DePauw team were Andrew M. Cullison, Maria R. Dahman, Dinah L. Hanson, Amanda L. Miller, and Christopher J. Weaver. Outstanding DePauw philosophy majors may produce a substantial research paper on an important topic in philosophy. Students doing so work with a faculty thesis advisor. The project culminates with an oral defense of the completed paper. Evan Amies, "Morality in a Naturalistic Universe." Amanda Arnold, "First Do No Harm: Justice in the Healthcare Crisis." Robert Blau, "Defending Political Realism." Elizabeth Campbell, "Rectifying Our Belief in Choice: The Superiority of Libertarianism." Issac Colon, "Problems with an Atemporal God." Peter Curts, "Friendship and Agape: Moving Towards a Loving Union." Phillip Exline, "Points of Connection and Disagreement between Two Existential Philosophers on Chrisitianity: Nietzsche and Kierkegaard." Michael Hurley, "Plantinga and the 'Rational Acceptability' Thesis." David Morine, "Investigations in Translation: The Experience Theory." Alexandra Nelson, "Altruism: Lost in Duty or Found in Degrees." Shannon Starr, "A Defense of the Dao De Jing: Against Purposive Daoism and Legalism." Daniel Story, "Yes, I Would Consent: Reconciling the Death of Infants with the Love of God." David Szydloski, "Feyerabend and Polanyi: A New Look at Professionalism." Andrew Watterson, "Distributive Justice and Organ Allocation." Results of the most recent regional Ethics Bowl competition are available from Marian College. More information about student/faculty collaboration in ethics is available at the Janet Prindle Institute for Ethics. Many more examples of student research and creative projects at DePauw are here at Academic Affairs.